For a casual and laid back environment, furnish your home with this transitional dining and occasional piece collection. The dining pieces in this collection features neat straight lines and upholstered leather seats. Host a dinner party while gathered around the dining table and use the sideboard for serving food and drinks. The pub chairs in this collection can also be used in the bar area of your home because of their elevated counter height. 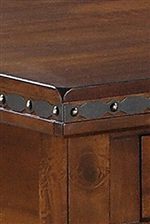 Each occasional table has incredible detail to define, from caster wheels to metal accented edges, to angled corners. There is something for everyone in the 1268 collection. 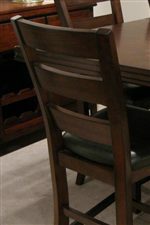 Browse other items in the 1268 collection from Miskelly Furniture in the Jackson, Pearl, Madison, Ridgeland, Flowood Mississippi area.